​And these 5 attributes are what make the UnslingIt Carry System so unique! THE UNSLINGIT IS SUPER LIGHTWEIGHT! ​Made of 550 Tactical Paracord, the entire UnslingIt Carry System weighs less than 6 ounces! The UnslingIt is so light and compact that you can take it off and put the entire thing in your pocket! 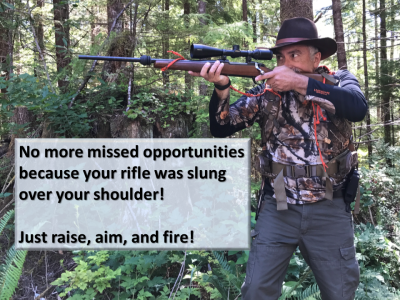 Try that with a standard rifle sling!The fact is, you will not find a lighter, more compact sling that does everything the UnslingIt can do. ​THE UNSLINGIT IS REALLY STRONG! ​A single strand of the UnslingIt has a breaking strength of 550 pounds. Whats more, the UnslingIt uses no buckles, snaps, grommets, sewing, or other connections that compromise the strength of the system. Other slings use sewn or riveted webbing that cause weak connections. Not the UnslingIt! The UnslingIt is strong, STRONG, STRONG! ​This is not cheap paracord bought at some discount warehouse. We only use USA made, military grade Paracord. It is impervious to sun, rain, and snow. You know, the type of weather you hunt in! 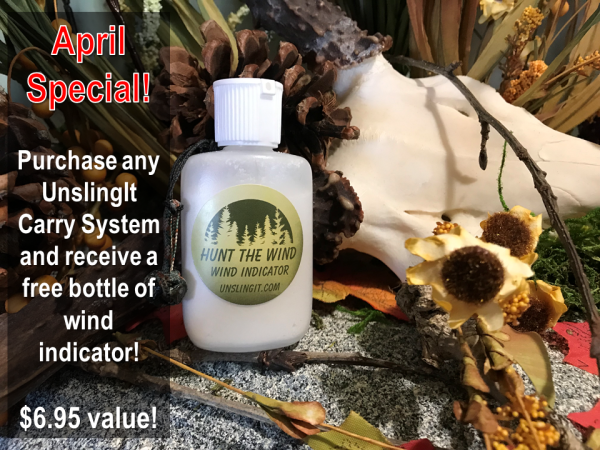 In fact, we are so sure of the UnslingIt, it has a lifetime warranty ! 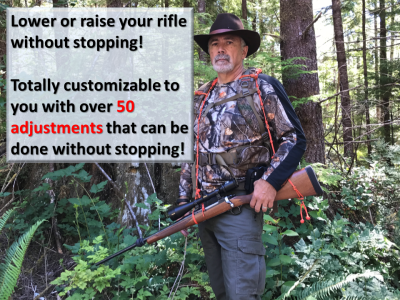 ​There are over 50 combinations you can choose to carry your rifle using the UnslingIt! Attach it to your backpack and carry your rifle in front of you, barrel up, barrel down, and every position in between! Use it as a standard sling, use it without a backpack, use it in combination with a standard sling. Each UnslingIt harness comes with two 65" lengths of paracord woven into the shoulder pads which can be removed in the event you need bootlaces in the field, or need to make emergency repairs to a piece of gear. 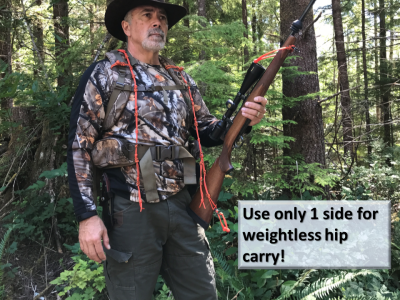 ​Did you know you can use only 1 side of the harness as a sling and use the other for a tourniquet, or deer drag, or for survival purposes? This baby is the versatility boss! ​Why do so many hunters buy products that use plastic or metal buckles, grommets or rivets? Not only do these items fail over time, they make noise during the hunt! 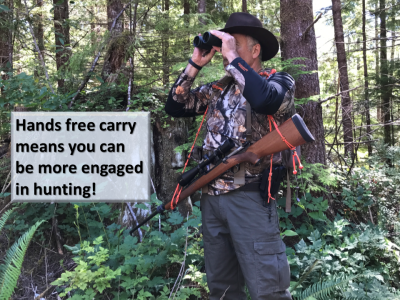 One 'click' from a buckle hitting your barrel, or tapping on your binoculars, is all it takes for the buck of a lifetime to be gone. The UnslingIt has nothing, NOTHING, that will make a sound in the woods. It is deadly quiet! 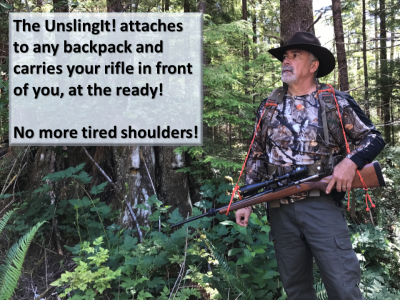 Give yourself every advantage and get the UnslingIt Rifle Carry System. ​CHECK OUT JUST SOME OF WHAT YOU CAN DO BELOW!